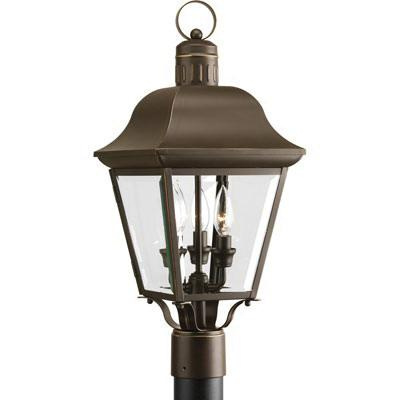 Progress Lighting Andover Collection Traditional/classic style post lantern in antique bronze finish, features aluminum construction and clear beveled glass panel shade. This post lantern accommodates three 60-Watt incandescent lamps that have phenolic candelabra based socket. Lamp has voltage rating of 120-Volts. It measures 9-1/2-Inch x 22-3/8-Inch. This post lantern with 6-Inch long lead wire, features post-top fitter for 3-Inch post/pedestal mounting. It is suitable for outdoor lighting. Lantern UL/cUL listed.